Submit your ideas or articles to bcolley@colleyweb.com and please consider donating to the History of Redding so I can continue to provide updates to this web site. The coming of the Railroad, built between 1850-1852 from Norwalk to Danbury sparked the businesses of West Redding. Before that time Side Cut/Simpaug Trpk. did not cross and connect to Long Ridge Road, at best the section of road currently running from Side Cut to Long Ridge was a dirt path used by the locals but not a main route of travel...for example the Stage coaches ran across either Simpaug Turnpike or Merchant Rd. to Picketts Ridge to George Hull Rd. to Long Ridge and points north. 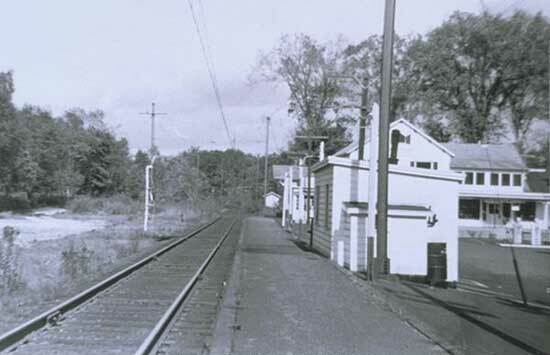 With the addition of the Railroad came a depot, post office and a store. J. L. Griffin appears to be the first selling Dry Goods, Groceries, etc.. in the West Redding area. His name appears on the Beer's map of Redding business directory circa 1867 as a dealer of Dry Goods and Groceries. The building stood where the Baptist Church is today (2006) on the south side of the tracks and has been said to have been built in 1864 so it's a good bet that it was Mr. Griffin's store initially. W. Griffin, a relative, lived directly behind the West Redding store in the house still standing today on Side Cut (though modified I'm sure). Later a man named, William Mandeville, owned and operated the West Redding Store prior to 1900. Not much is known of him outside of his name being mentioned. 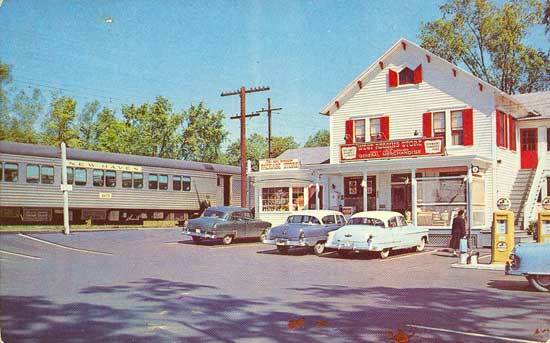 The business was in a good location, due to railroad traffic. Looking to draw more people, the Danbury/Norwalk railroad company had converted an old church (Methodist) campground into a picnic/recreation park area they called Brookside Park in West Redding. The entrance gates (stone pillars) of this park is still standing over at the current West Redding Post Office employee/service entrance and parking lot. Brookside Park opened (slash) re-opened officially as a recreation park in 1878, but historically the land was a popular destination from approx. early 1860's to 1900. It was 30-acres, it had a bridge crossing the Saugatuck River, a fishing pond, gold fish pond, and many gravel covered paths for walking, most of these paths leading to water fountains. It was very popular with New Yorkers looking to get out of the city to picnic and fish. So popular that a 2-story hotel was erected (burned down in 1900) and a band/dance pavillion was added. The first electric lighting generator in CT was said to have been installed here in 1884. The property also had a caretaker's house and cook's house. The next owner of the West Redding Store was John H. Jennings, at or slightly before 1900, the General Store also contained the Post Office in this period and probably had for some time. John H. Jennings had been active in town, he is one of the founders listed at Putnam Park (Redding/Bethel line). Putnam Park was formed in 1887, John was the Chairman of the project. When the Jennings owned the building it was a bit different in appearance- it had a large Bay Window to the right of the staircase on the second floor, 3 windows on ground level, white picket fence and gate at ground level to the right of the staircase leading to the second floor. What appears to be a 60 yr old maple tree in the front right of the main (center) portion of the building. During Jenning's ownership Samuel Clemens, a.k.a. Mark Twain arrived at West Redding Station in 1908. Many gathered in the West Redding Store's parking lot to greet him with cheers of welcome. Shortly after a shoot-out occured at this train station involving the local police and two burglars that had robbed the Twain estate of silver early that evening. Sadly, in 1910 Twain departed from this station for New York in a coffin. After Mr. Jennings came Emory P. Sanford. Emory came some time after 1914. It was in 1914 that his butcher shop in the Aspetuck Valley (Povery Hollow) of Redding Ridge was condemmed by the Bridgeport Hydraulic Company who felt the waste from his operations would contaminate their reservoirs. Forced out of business in Aspetuck, Emory Sanford arrived in West Redding and took over the West Redding Store shortly after. He sold a wide variety of products, including boots, shoes, paints in addition to groceries and dry goods. Emory was active in the newly formed West Redding Fire Department and is shown in many photos with the first firetruck in town outside his store. The first WRFD was to the right of the current WR Post Office, a simple barn that was later lost to fire. A photo in the 1950's shows it is still operating as a store and gas station that was likely added in the 1930's (though I cannot confirm that). The building has been altered by this period as a bay window was added to the left of the main (center) building and what appears to be apartments are to the right where the old bay window used to be. Photo's taken in the 1920's with Emory show the right second floor has been framed in as a porch already. Bay Window Package Store was occupying the left side of the building in the 50's and from my recollections they had expanded to the main (center) section by the 1970's, perhaps even the 1980's. In the 1920's Emory Sanford sold the building and property to J. Birdsey Sanford for about $3,100. In the period J.B. Sanford owned the store it was known as the Sanford Store. Gertrude Sanford, J.B.'s daughter recalled that "everything in the store was sold differently than it is in the present day. We had to cut cheese, and butter was cut from tubs by the pound. We had a coffee grinder, one of those great big old things. People would buy a pound of coffee beans and have them ground right there on the spot. Tea was sold by the pound...we had oolong tea and green tea. We had penny candy, if you'd believe it and there was a tennis court over where the West Redding Post Office is now. Everyone on that side of town came and played tennis there. In 1946 Ken Bell bought the General Store from J.B. Sanford. A little bit later the West Redding Post Office was erected by Mr. Bell, moving the firehouse in the process. The General Store, changing with the times, became more of a food store that a general goods store. From Ken Bell on the information about West Redding Store is spotted, likely due to the establishment of the Country Emporium across the tracks in the late 1950's. William Gordon was an owner in the 1950's and Fred Cole was the owner after Gordon. Most recently, the main building of the West Redding Store was a rock/mineral business popular with kids in the 1990's. West Redding's Red Garnets are well known in Natural History Museums so it was a good match for the area. The far right of the building was Gail's Station House, a breakfast/lunch restaurant in the 1990's from what I recall. Currently the building is home to the Baptist Church. If by any chance the parking lot is dug up for some reason and large amounts of clamshells are found. They came for West Redding's annual Clambake not Native Americans. 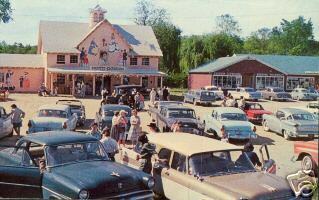 The annual Clambake was held each summer in the West Redding Store's parking lot. Native American's were in the area, I have maps that show their trails close to this area, but here at least, clamshells were not the work of Indians. As mentioned above- the construction of the Country Emporium on the opposite side of the tracks in the late 1950's had an impact on the West Redding Store. The Emporium was very popular and well known even to those outside CT. Mark Twain Library's annual book fair was held there initially. It continued successfully into the 1980's, and later became a Restaurant...think it still is. The history of the Country Emporium is as follows: On April 12, 1950 J. Birdsey Sanford sold a barn and a quarter acre of land on the north side of the RR tracks to Evelyn Marinelli for $2,000. Seven years later on November 23, 1957 the Marinelli's sold the barn to Michael Tree for $3,500. West Redding was changing in this time period, New Yorkers were finding Redding to be a nice, tranquil little spot in the country to rejuvenate themselves after a long, stressful work week in the city and began converting their summer homes into year-round residences. Michael Tree was a New Yorker himself, having run a flower shop in NYC he knew quite a few New Yorkers, and better yet their buying habits. Tree got the idea for a country store from two ex-Madison Avenue executives who started a store of their own in New Hampton, NJ. Mr. Tree traveled the country for ideas on how he'd like to set up the store. Having viewed close to fifty shops he knew exactly how he wanted his store to look and operate before he began building it. One characteristic he felt was most important was that when a customer walked in he or she would be able to see only a small portion of the store. This way the mystery of the store remained and customers would make several visits in order to cover all the items. His floors would be stacked from floor to ceiling with odd and unusual tools, gadgets, and foods found almost no where else. Initially there were no plans for a restaurant, but later on was established. Michael Tree spent a little over two years fixing, renovating, repairing and buying stock for his store. He turned the building in two rooms with an upstairs shop, where hay was previously stored. Tom and Helen Lalley, long-time residents of West Redding related: "the interior boards of the Emporium were taken from the Shepard Tannery in Bethel, CT, and if you look closely you'll see they'll full of nail holes that were used to tack skins up for curing. Mike Tree liked the antique look of them so he managed to get them from the Shepards." Tree also procured hundreds of antiques for the store, which he hung on the ceilings and walls, and did not put up for sale. Outside of the building he hung a "T" from an old Woolworth's sign and weather vane in the shape of a tree. Inside, the Emporium looked exactly as Michael Tree had envisioned it. For a finishing touch he added a penny candy counter and a huge round of cheddar cheese. Jean Dalrymple, Wallace B. Dunckel, Carleton Scofield, Gypsy Rose Lee, Jesse Rice Landis, Franklin Heller, Baron Polan, Jerry Mason, Joan Vandemaele, Genevieve, and Julie Wilson are examples. On Memorial Day, 1960, the Emporium opens it's doors to the public for the first time. It was a gala affair. Stars such as Genevieve and Gypsy Rose Lee were present at the opening, with celebrity Jean Dalrymple working the candy counter. More than a thousand people looked through the store on opening day alone. And at the end of just one weekend 90% of the Emporium's stock had been sold. The success was spurred by a rather large amount of "free press" the Emporium received from nationally renowned publications: The New York Times ran a half-page ad, that even Mike Tree wasn't aware of until reading it himself the day is appeared, full page coverage in the Christian Science Monitor and Gourmet magazine and a quarter page spread in Look magazine. The Emporium's success and popularity continued and as a result and several other factors, Mike Tree began serving food. He credited two major influences in his decision to open an eatery: #1, he had been giving out free coffee since the opening, and people began to bring in their own bread, rolls and snacks to the store. #2 was his friend, Jean Dalrymple, who felt it would be nice to have a place to eat at the Emporium. There was a regular cook on weekdays but on the weekends there were celebrity cooks in the kitchen. Jean Dalrymple, Genevieve and Gypsy Rose Lee all cooked on weekends. The basic menu consisted of pancakes, but as time went on famous foods such as dillybread and dillyburgers, hot chili, and all kinds of pancakes were created. There are varying opinions as to how Redding accepted the Emporium. The Tree's felt that a first Reddingites did not want it, but after realizing it was good for the town they began to accept it. Herb Bronson recalled that, "it was an accepted enterprise, probably well worthwhile." Gertrude Sanford said, "It's very popular. I don't recall anybody resenting it. I think they rather liked it." The Lalley's felt acceptance was gradual, but successful." After a few years the original celebrities involved began to fade away, but other stars replaced them. Mary Travers held her wedding reception there, Tyrone Power has been there, and Paul Newman brought his mother to the Emporium for Mother's Day one year. The actual economic influence of the Country Emporium in West Redding is limited to the growth of a small row of stores adjacent to it and there is no written or factual evidence to indicate any growth caused by the Emporium. But one thing that has grown is the reputation of the establishment. Michael Tree said, "I built the Emporium so that people from out of town could see the beauty of Redding." Which is exactly what happened. "If you go there now." said Bert Bronson, "you rarely see a local person. They're all from Ridgefield, Southport, Westport, or some place. No matter where you go everybody knows about the Emporium, so apparently it's quite well known." And it was. Anita Galer and her husband Gilbert purchased the Emporium from Mike Tree on June 19, 1978. *much of this history comes from Adam Foster's oral history project interviews and his article that resulted from them. More to come from Adam's amazing work very soon. The Country Emporium, restaurant, general store and Redding landmark, was severely damaged by fire in March 1986. Today(2013) the site of the old Emporium is owned by Dottie (Earle) DeLuca who has been buying and selling antiques for 25 years. Although a professional dancer/singer for 16 years she always kept up her love for the other arts as well. In between shows on Broadway or kicking up her heels as a Rockette at Radio City she would be hitting the flea markets or estate sales in search of that diamond in the rough and usually found it. Now she brings it to you. Big Man, typical fine American, a fine expansive spirit, direct, generous, honest, upright. There are adjectives used by seven people I interviewed to find out about a man who was possibly the most influential person in Redding. His name, William Ryder. Mr. Ryder was an elusive individual when it came to the Oral History Project, although he essentially initiated this endeavor. It all started the day my mother, my sister, and I were selecting a Christmas tree from Mr. Ryder's lot when he started to tell me a story. A am told that I was captivated- I'm not too clear on the details as that was six years ago. My mother noticed my interest and thought to herself, "It's too bad that other people can't hear these stories." She approached Mr. Daniel Fuerst, Mrs. Averill Loh and Mr. Donald Wendell with her brainstorm that would later be known as the Redding Oral History Project. I am unhappy about the prospect of using the past tense throughout this narrative, however, I hope the man will be brought to life by the friends who knew him. As Hjalmar Anderson said, "Bill Ryder typified the real rugged New Englander who's honest as the day is long. He was ready to help at any time but a little bit risque and a little bit blunt in the way he expressed himself. Underneath all that he was certainly the heart of hope, no question about that. As I say, the thing that stands out the most is real, solid, four square integrity in every way." Mr. Ryder had many friends who he acquired during his 83 years. Mr. Boyd was one of his closest friends. Mr. Boyd wrote his recollection of Mr. Ryder: "The first time I remember meeting Mr. Ryder was when, one evening, I was working on a house on Diamond Hill. We talked for quite a while, and when he was leaving he put his hand in the pocket of his denim jacket and handed me a couple good apples. This meeting was the beginning of a friendship I will always cherish." "During the next 28 years I found out a lot about his life, and most of the time we would sit on the tailgate of his truck and just talk." "Mr. Ryder attended the Red Brick Schoolhouse on Umpawaug Road. One of the games at noon recess was to try and throw small stones through the opening in the peak of the school gable. Evidence of some poor marksmanship are the chipped bricks, surrounding the opening. "Many initials of the scholars of bygone days are carved in the bricks at the end of the school. Of these W.R. is the one that really catches the eye. Mr. Ryder told me he arosed the teacher's ire by carving deeper than anyone else. To help right a wrong he was ordered to fill up the carvings. He complied but, so his art work would not suffer, he filled the letters with plaster of Paris. These initials stand out white and plain today." "One girl at the school when Mr. Ryder was a boy, seemed overbearing to a point where she became the target of a little prank. The sanitary facility was the customary outhouse, partitioned so that one side was for the girls and the other for the boys. But below the seat there was no divider. Using his inventive mind the Ryder boy figured out that by cutting a paddle to a certain length and angle he could reach the seat area on the girls compartment via the hole below the seat in the boys compartment. He waited patiently for his prey to use the facility, and when she did he lower the paddle under the seat on his side and let her have it with a few good whacks to the backside. She raced out the door, into the school and soon stern measures were taken on the Ryder boy by the teacher." The school was very important to Mr. Ryder for the rest of his life, a teacher there became his bride. He always made sure the building was in order. "Mr. Ryder later attended Connecticut Agricultural College, now UCONN at Storrs. When a member of my family (Boyds) was a student there, in the early 1970's, Mr. Ryder gave him a school pennant which he had kept since 1916." "Above the entrance to one of the main buildings at Storrs, in a rather inaccessible area, the initials W.R. appear again. To enable him to accomplish this work of art, Ryder enlisted a classmate to hold him by the heels, upside down, from the 2nd floor window while he did the carving." "Not long after his discharge from the Army during World War I, William Ryder traveled to Kansas where he helped with the wheat harvest and the large harvesting machinery in use then. He often spoke of the long hours and people that worked there." "When he returned to Redding, he spent most of his life running the beautiful farm and nursery on Umpawaug Hill. The white barn and outbuildings attest to his industrious nature. The walls on the inside of the building carry a pretty good record of dates and important events occurring over many years. In those years he ran a very productive construction business, and many Redding residents live in the fine houses he built. "It's more blessed to give than to receive. This must have been William Ryder's motto, and if so he must have been more blessed than any man I have ever known. When one paid him a visit it was impossible to leave without his giving you something to take along, and if you refused, it would show up at you premises in a couple of days." More to come on William Ryder soon. For many years they had a horse named "Rocket" who was very much a member of the family. 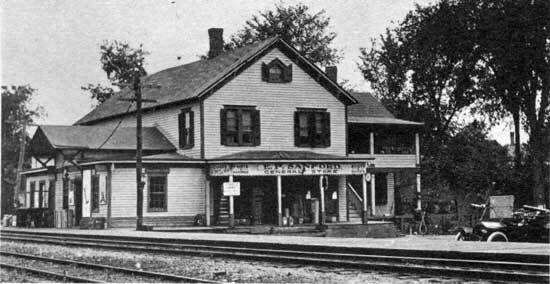 Ives would ride "Rocket" down the hill to Sanford General Store near the train station. They also had a Model T Ford. Umpawaug Road in those days was just a dirt country road, filled with "thank you ma'am's, as Ives's nephew Bigelow describes it. It wasn't paved until 1928, and when it was, Ives got quite upset. He was also outraged when the first airplanes began flying over, and whenever he heard one he would come out and shake his fist at it and shout "Get off my property!" He didn't want anything to disrupt the peaceful country world of Umpawaug Hill which he loved so much.